What a year I have had. First I got to be with my 9 yr old while he killed his first deer with a compound. Then I got to be with him while he killed his first buck during rifle season. If that wasn't being blessed enough, I was fortunate to take a nice deer with my longbow this past Thursday. I had been hunting this spot off and on the past few days and seeing a lot of deer and even a nice buck. I had been getting several pics of this deer as well as some nice 8 points and knew it was a matter of time before one of them slipped up. Thursday morning was no different than the past few days. Started seeing deer constantly. I had a small 8 come in and gave me every opportunity if I had wanted him. I had some deer around me when I looked up and seen a yearling coming in. I looked back behind her and a bigger 8 was coming. I had my mind set to take him if given the chance. I had no more than had that thought when I noticed movement behind the 8 and this deer was behind him. They stayed out of range for what seemed like forever before this deer finally made his way in to feed. 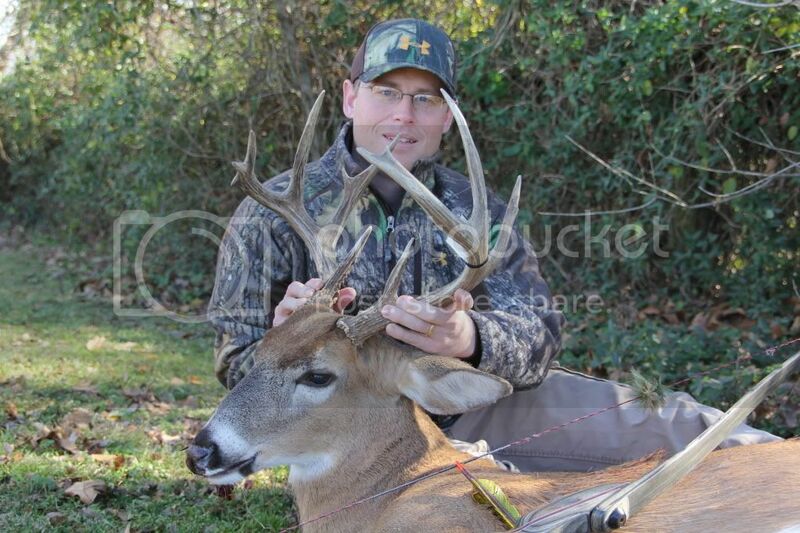 He came in perfectly and at 16 yds I sent a broadhead straight through him. It kind of surprised me to see my arrow disappear completely. Shooting a longbow, I never thought I would get a passthrough like that. What made it even better is I got to watch him fall within sight. I even got my wife to help me load him, which is a big deal for her. I also want to thank my good friend TD for the skinning job(lost a bet),future mount and most of all getting me into traditional bow hunting. I can't thank the Father above enough for allowing me to take such a beautiful animal. Nice buck, love the character in the rack! What a great buck! I love that right side contrasted with the typical left! Nice one,congrats.Hope your new year is as good as the old one. congrats on a good looken buck!! Beautiful bow, glad to see you are getting more blood on it than I did. Congrats to your son also.